You have a CV, you’ve been looking for jobs on all the job boards and still nothing? Have you thought about trying social networks? In today's digital age, this is another very effective way to find a job, or at least stay in the loop regarding the market and job opportunities. Companies, as well as recruitment agencies increasingly use social networks to find talent, and potential employees. 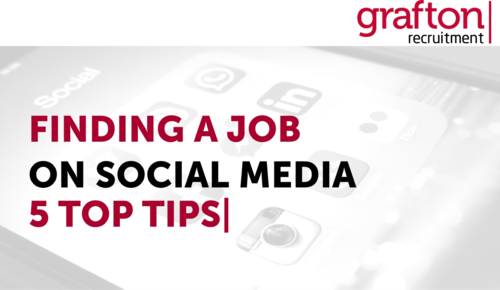 So how do you use social media to aid your job search? Make sure that your profile is presentable to future employers. If you are looking for work on social media, professional photos on your profile is the basic starting point. In general, keep your profile professional, as you never know who's looking at your profile. This is easier said and done on LinkedIn than on Facebook. Photos: Consider what photos are on your profile that the ‘public’ can see. Photos that portray you in a positive light are what you’re aiming for, NOT the photos of your drunken antics in Magaluf Summer 2016! We recommend that you adjust your privacy settings, in the first instance so that you have to approve pictures you are tagged in before they’re displayed on your profile. Secondly adjust your settings to only show certain content of your profile to ‘public’ visitors for example in the ‘About’ section include a brief description about yourself, your work experience and skills then make it viewable to the public. It also wouldn’t hurt to include a link to your LinkedIn profile! Content: Be aware of posting inappropriate content which you wouldn’t want a potential employer to see. Although you may think that your posts are set up only for viewing by your friends, there may be changes in privacy settings by the network administrators, so you should regularly check your settings to be sure. Publish it to the world that you are looking for a job. First off, this advice, only applies if you're currently unemployed. Otherwise, look for work more discreetly, the power of social media is far reaching and you don’t want word getting back to your current boss that you’re looking to leave. So if you’re out of work, publicise you are actively seeking a job, the type of work you are looking and in what field. Don't forget anything else that might be relevant as you never know who could pass your details on to a future employer. Keep an eye on potential employers. If you already have an idea of what you wanted to do, or what company you would like to work for, actively monitor that pages that relate to that sector or that specific company’s social media. Why? You can get interesting information about the fields that interest you, as well as being able to keep an eye out for recruitment campaigns or changes within the business. In addition, on LinkedIn you can connect with the HR Manager or HR Specialists from a company who may post vacancies they are recruiting for. The same approach as above can be used for recruitment agencies too; we regularly post vacancies on our Facebook page as well as on Twitter and LinkedIn (check us out!). By following us on social media you not only get an overview of the latest market trends you also benefit from visibility of the wide range of jobs we have on offer, from many different clients in a plethora of sectors. Be aware of industry trends. Time for a bit of research - if you have not already done so, it’s time to follow the latest news and articles from companies in the sector that interests you. There are various articles published by companies, experts in the field or potential colleagues that can expand your knowledge. Once you have a good grasp on the sector you can read, share and comment on articles/posts. As long as your comments are relevant, this can increase your visibility to those in the field and even potential employers. If you want to find out more about how to manage your online reputation you can check out our previous blog here.